Do you find it hard to eat healthy when you travel? Now this may sound weird but, I think I actually eat better when I travel. Why? Because, I do not want to feel sick when I am not at home in my comfort zone. To be honest, I think we use traveling as an excuse to cut loose a little and eat the way we use to before we decided to eat healthfully. Think about it. How many times have you said, “After my vacation I will get back on track.” I am not saying a little indulgence once in a while is bad, but come on how many once in a whiles are you having? I have tried to make it a rule when I travel to make sure the indulgence is worth the bite. Is the indulgence really worth the second bite? I will give you examples from my day. Breakfast: I ordered a veggie omelet with hash browns on the side and gluten free toast. The omelet was a rather large portion so I only ate half. The hash browns were okay, but not worth more than a couple of bites. The toast was good. It is hard to get gluten-free bread when you eat out. This was my little indulgence. I only ate one, instead of both showing some restraint. Besides I was full, and it was not worth going into the bonus round level. Lunch: I tried out a restaurant I had never been to. The chef was a James Beard award winner (That is a big deal in the foodie world). Their theme was innovative small plates. I liked the idea of something light, but would not leave me starving in two hours. I tried a fixed menu of salad, main course and a dessert. The salad was an unique seafood salad. Consisting mostly of matchstick veggies and a variety of different seafood. The plate was artfully displayed. The bites matched the beauty of the plate. This salad was worth the bites. The main course was just as beautifully plated ( a stuffed chicken breast with ricotta and spinach on top of mashed potatoes with a mushroom demi-glace sauce). It actually sounded better than it tasted. The main dish was a little over cooked and dry. Needless to say, it was not worth all the bites it would require to finish the dish. I left some on the plate. Finally, the dessert was a chocolate torte cake with some kind of gelato and a raspberry sauce. Once again the plate was beautiful. However, there was no flavor. I expected to taste chocolate in the cake. I did not. It made me somewhat sad because I really like chocolate cake. I had literally two bites. It was not worth eating. The gelato was velvety but had no flavor. I tried two bites, still no flavor. The raspberry sauce was divine. That was worth every bite. I wish there was more of the raspberry sauce. Dinner: Tried a new to me restaurant that pays homage to the origin of food, with farm-fresh ingredients and naturally raised products. We started our meal with a cheese board. What is nice about an appetizer like this is that there is variety. Since there is a variety of items, if there is one you do not like you can try something else and save some bites. My main course was Diver Scallops and Spring Vegetables. This was a healthful and worth every bite dish. When the meal was completed I was satiated and felt good. It all comes down to choices. Are you choosing to take bites out of things that are only mediocre or are you going to take the bites out of something amazing? Are you going to take a bite of something that will not make you feel good or that you will regret later on? Which bite will you take? There are three recipes that I like to use when I want to clean out the refrigerator and not let anything go to waste. These recipes are the best way to use the spoonful of leftovers you might have. The first one that I have told you about is frittatas/egg bakes. My Sweet Potato and Zucchini Egg Bake is one of the most viewed posts to date. I have to admit it is very pretty, colorful and loaded with nutrients. My second favorite way to use leftover veggies is making pasta. For instance, I almost always have an extra chicken breast cooked, spinach greens, peppers (red, yellow and orange are my favorites). Throw in some diced onion, minced garlic, zested/juiced lemon and chicken broth and you have dinner. I always have gluten-free pasta in my pantry. This works in a pinch if I do not have time to make homemade pasta, which is still my favorite. What is nice about using up those bits of leftovers is that your dish is never exactly the same anytime. It is a culinary adventure. The third thing I like to make with whatever is in my refrigerator is soup. Throw in some protein, veggies, onions, garlic, herbs and broth and you have a beginning of a meal. Pair your soup with a side salad and some Focaccia bread and you are ready to eat. All three of these ideas can take 30 minutes or less. There is no reason you can not make a nutritious meal morning, noon or night. Plus, no more science experiments growing in the refrigerator. What I like about this salad is that it is fresh tasting, colorful and has a crunch. Down here in Florida we are in the height of our growing season. So while those up north are planning and preparing their gardens, we are enjoying ours now. It is wonderful. This is the easiest salad I think I’ve ever made. I served this with a pan seared chicken breast. Delicious. Combine all ingredients and stir. Serve. Eat. Enjoy. 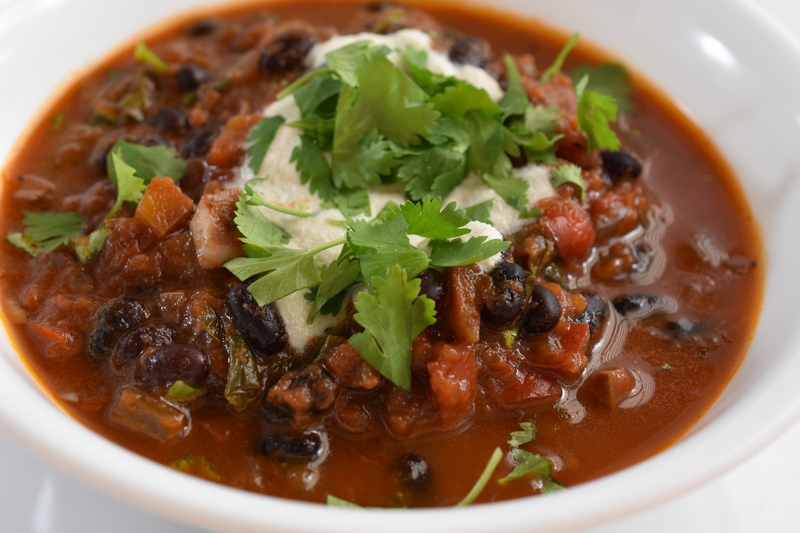 This is a veggie packed chicken chili. Anytime I can pack in a load of veggies into a dish I’m a happy girl. This is a fairly quick meal. Double the recipe and you could freeze some for a just in case meal. In a large dutch oven over medium heat sauce orange pepper, onion, celery, garlic, bay leaf and seasoning. Sautee until veggies start to become tender. Add ground chicken. Cook until chicken is cooked through. Add tomatoes, kombu and butternut squash. Stir all ingredients occasionally. Simmer for about 30 minutes. Add tapioca flour; stir well. Cook for another 5-10 minutes. Serve. Eat. Enjoy. Note: You could add some jalapeño if you desire a little heat. You could also garnish with some cheese, greek yogurt, or sour cream. This is one of the easiest dishes you will ever make. It is flavorful and extremely tender. I served this with roasted butternut squash and steamed spinach for some color on the plate. Delicious. Heat avocado oil in a large skillet over medium heat. Meanwhile, pat dry tenderloin with paper towel. Generously season tenderloin with seasoning. Brown all sides of tenderloin until a crust forms on the tenderloin. This will do most of the cooking. When all sides are browned turn heat down a little and cover. Cook for about another 5-10 minutes. Remove from skillet and let rest. Slice tenderloin on the bias. Pour beef broth in skillet and scrape all the bits of goodness loose. Reduce liquid to half the volume. Ladle over tenderloin. (This is when I would add he spinach. It is virtually in, stir and out of the skillet. It cooks that fast.) Serve. Eat. Enjoy. 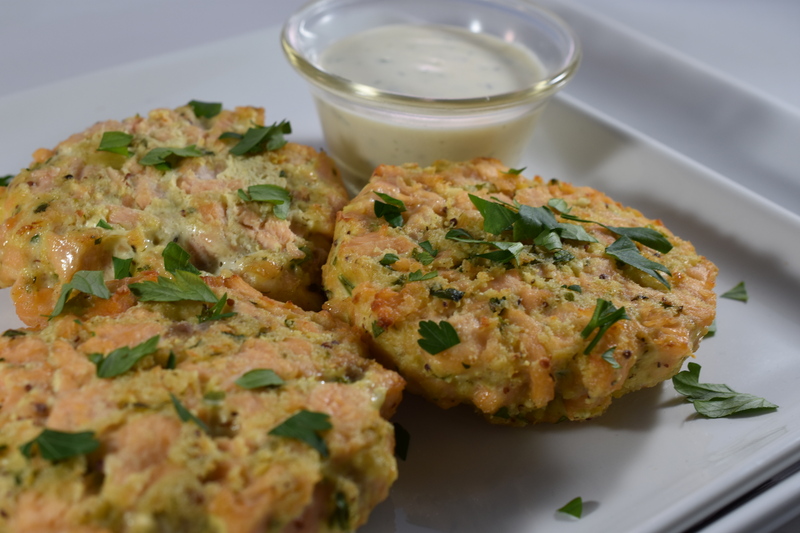 These salmon cakes are fresh and flavorful tasting. I use salmon filets instead of the canned salmon. It makes all the difference. Preheat oven to 400 degrees. Grease sheet pan with favorite oil. In a large bowl combine ingredients. Mix until just combined. Form salmon mixture into patties. Place on greased sheet pan. Bake in oven for 10 minutes. Turn patties over and bake for another 10 minutes. I like to then broil the patties to get a little brown on the patties. Be careful and watch the patties because hey can burn quickly. Remove and garnish with some freshly chopped flat leaf parsley. 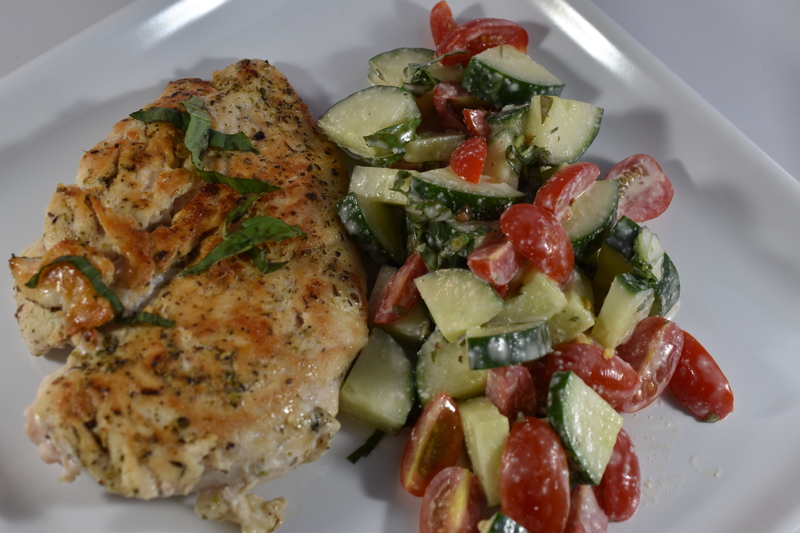 Serve with herb dressing/sauce. Eat. Enjoy. I initially made this sauce to go with salmon patties. However, it has taken on a life of its own. This makes a nice dressing for a salad, dip for veggies, and even a marinade for chicken. It is very versatile. This has become a staple in my refrigerator. Combine all ingredients and mix well. Chill for 30 minutes. Store in a a 8oz. mason jar with lid. Serve. Eat. Enjoy. Here is another recipe for those overripe bananas. Let’s face it. You can only make so many banana breads. This makes one 8-inch round. You can double the recipe if you want to make a layer cake. 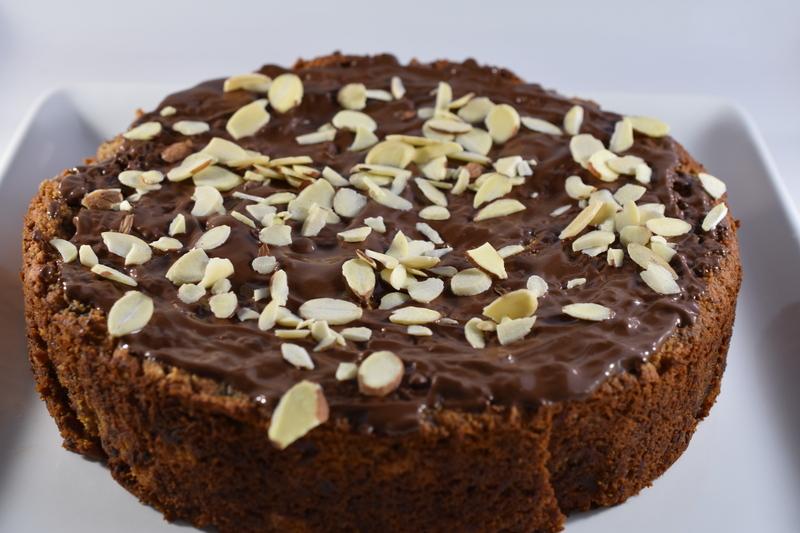 For a brag worthy dessert, top cake with a drizzle of melted chocolate and some sliced almonds. Little whipped coconut cream would be sublime. Preheat oven to 350 degrees and lightly grease 8-inch round cake pan. Place bananas on a foil lined sheet pan. Pierce bananas with fork by 1-inch increments. Bake in oven for 15 minutes. Remove from oven and set aside to cool. Place dates in a large bowl and cover with boiling water. Set aside for about 5-10 minutes to soften dates. Break up dates with a fork. Add bananas and mash both together; blending together but still keeping it chunky. Add maple syrup, applesauce, lemon juice and vanilla. Whisk ingredients until combined. In a separate bowl, whisk together flour, baking powder, baking soda, cinnamon, nutmeg and sea salt. Fold dry ingredients into the banana mixture. Pour into prepared cake pan. Bake for 30-35 minutes. Place on cooling rack and let cool completely before removing from cake pan. Melt oil and chocolate chips in a glass measuring cup in the microwave. This takes about 30-45 seconds. Drizzle or spread on top of cake. Sprinkle some sliced almonds to add another element of texture. This recipe is for my vegan friends. It has been a while since I made this dish. It is veggie packed, gluten free and delicious. 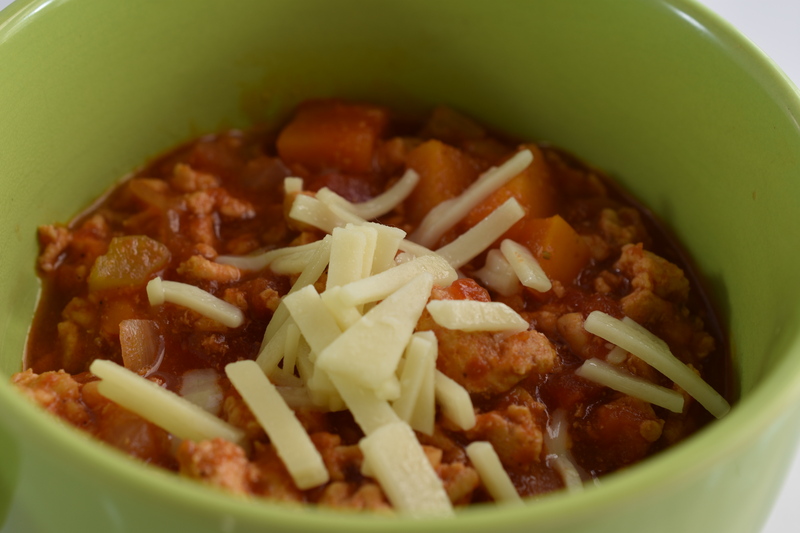 This can be made on the stove top or in a slow cooker. It smells so good either way you make it. This would be good with a slice of my focaccia bread. In a large dutch oven over medium heat add the onions, carrots, celery, red peppers and garlic. Cook until veggies have softened. Add beans, vegetable broth, kombu, tomatoes and lime juice. Bring to a boil. Reduce to a simmer and cook until beans are tender. Just before serving add cilantro and top with a dollop of cashew cream. This dish is very tasty and can feed a crowd. No one will ever guess it is healthy. You can make it with or no heat. I made it with some heat. Okay, a little more than some heat, more like fire. Maybe next time a little less fire. Preheat oven to 375 degrees. Grease 9 x 13 baking pan. Pulse cauliflower in a food processor until reduced to rice-sized pieces. Pound chicken to about 1/2-inch thickness. Season with smokey southwestern seasoning. Drizzle avocado into a large skillet. Over medium heat cook chicken breast for about 4 minutes on each side. Remove chicken breast and set aside. Add cauliflower, onion, garlic and orange pepper. Sprinkle veggies with seasoning. Cook for about 8-10 minutes, stirring occasionally. Transfer to a large bowl. Chop chicken and add 1/2 c cheese, BBQ sauce, cilantro; stir. Combine veggies with chicken mixture, stir. Transfer to baking dish and spread evenly. Top with remaining cheese. Bake in oven for 20-25 minutes.